An intriguing combination of vintage and rustic, this oversized elegant cabinet offers five fixed storage shelves behind metal wire doors. Finished in mottled white and dove grey, the poplar and pine wardrobe is trimmed with curved brown details. 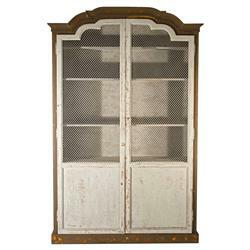 Metal mesh screening adds country charm and an opaque screen to the double doors, hiding your treasures inside.